Street plays have their origin in the effort to find a voice for the people by the people. An age old art form that existed eons before the more structured and regimented form of theatre came into existence, street plays made an effortless comeback on the performing arts scene in India, prominently during the era of the freedom struggle. This form of theatre requires the bare minimum of props and targets mostly a non-paying audience. Since electronic amplification is not a choice, voice optimisation is something every actor has to practise. With themes pertaining to the daily lives of people, street plays function as an efficacious wake-up call to the slumbering public amidst the tumult of corruption and social degradation. Konkani street play producers have carved a niche for themselves in developing this medium first and foremost for the promulgation of the language in the state of Goa. This direly needed recognition of the significance of Goa’s mother tongue has been provided by college lecturers, Jayesh Raut and Gorak Sirsat. Jayesh Raut, a Konkani lecturer and a life skills trainer at Fr. Agnel College of Arts and Commerce, Pilar, recounts his emergence onto the drama scene in Goa. A childhood passion for acting is the catalyst for his vibrant presence in this art form. Be it monologues, nataks or even tiatrs, Jayesh has done it all. His venture into street plays in the 11th standard would, therefore, not come as a surprise. He visualised street plays as the optimal means of creating awareness for the cause of Konkani. Initially, he asked his lecturers to write the scripts for him. Later he began writing his own scripts. It has been 8-9 years since he began and his focus has been gradually divided in consideration of the range of social topics that could be taken up. It was a time when the street play craze had caught on in colleges and its ability to effect dramatic change was recognised. However, Jayesh realised that flaws existed in the prevailing format, in that the audience was not given due consideration during the enactment of the plays. Using his ingenuity he devised a new approach affording a forty percent change to the format. The concentration was on body language coupled with striking dialogue. Hand gestures were developed to maintain the momentum of the play. A stroke of genius was the use of catchy Bollywood tunes that the audience was already familiar with. These melodies were integrated with his own awareness driven lyrics so people would remember the message by connecting it with the music. Yuva Mahotsav, a two day youth festival organised by Konkani Bhasha Mandal every year, provided the perfect platform to showcase these new techniques. Many colleges including St. Xavier’s College and Carmel College have honed their presentation skills using Jayesh’s innovations. He has personally trained students from other colleges. His own college students have won the street play competition thrice at the Yuva Mahotsav. With regard to the importance of the script in comparison to the format, he emphasises, ‘Though the format matters for the success of the play, a lot depends on the script. Many lecturers use fancy words. The language has to be simple to reach the common people.’ Gorak Sirsat is a good friend of Jayesh, and has collaborated and redefined script writing after having his work appraised by Jayesh. Gorak Sirsat, previously a Konkani lecturer at Carmel College, had his interest in street plays stirred because of their high calibre as a medium of teaching. His plays revile the evils of society that trouble him, be it mining, the language issue, atrocities against women, suicide prevention, etc. Under his tutelage and with training from Jayesh Raut, students of Carmel College too have shone at the Yuva Mahotsav. 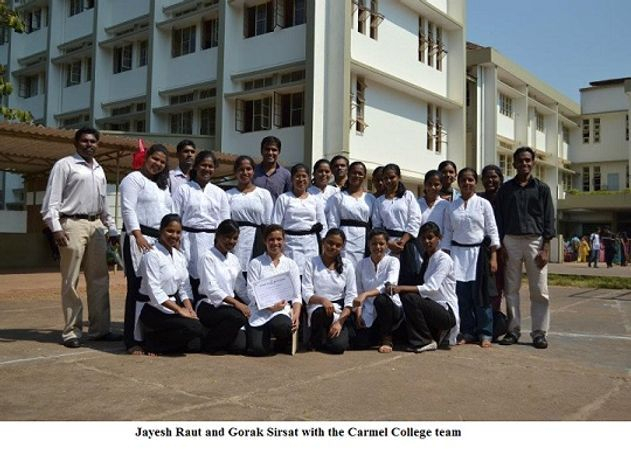 Jayesh Raut and Gorak Sirsat have participated in many competitions, and Gorak has trained students from Miracles High School, Sanguem, Sarvodaya High School and Ravindra Kedekar School of Konkani Bhasha Mandal to meet with success at competitions. Nonetheless, social awareness is the main motivation for the duo. Both have actively aided government institutions to further social causes. Jayesh has nine street play teams in his college and they put up seven to eight street plays in a month. They have tie-ups with NGOs and this activity is totally for social work. Jayesh Raut, who is currently pursuing a Ph.D. in Education, stresses the negative tendency to get carried away with the spirit of competitiveness. He says, ‘The main intention behind street plays is awareness, not winning competitions.’ This is advice that should be kept in mind by those involved in the art form.